One of my favorite times to create memories with the kids and grandkids is at Halloween. One of the most recognizable symbols of Halloween is the pumpkin. Here are several fun ways to use pumpkins. 1. Roasted Pumpkin Seeds: Roast the seeds from young or small pumpkins for a tasty snack. Rinse the pumpkin seeds until all the pulp and strings are washed off. In a medium bowl, combine the Worcestershire sauce, melted butter or blend, and salt. Add the seeds and stir until they are coated. Spread on a baking sheet and bake at 225° F for 1 to 2 hours, until crisp. Stir frequently to prevent scorching. Makes 2 cups. 2. 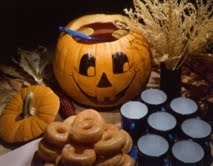 Pumpkin punch bowl: This jack-o’-lantern becomes a punch bowl for any occasion. Thoroughly clean the inside of the pumpkin, making sure you remove all the fibrous strings. Paint a jack-o’-lantern face on the pumpkin with acrylic paints or a magic marker. Refrigerate the empty pumpkin until serving time. Pour the drink of your choice into the cold pumpkin. 3. Painted Jack-o’-Lantern Faces: If you do not cut into the pumpkin and you keep them in a cool place they can last up to a month. You can let the artist in you come out when you take acrylic paints and paint on pumpkins. It is also fun to add scarves, bandanas, ribbon and feathers to the head of the characters that you paint. Instead of having people carve the jack-o’-lantern, have them paint faces on the pumpkin. 4. Dry Ice Jack-o’-Lantern: The key is to know how to deal with the dry ice and also make sure that children are never near the dry ice. You will need a pumpkin, carving knife (you can buy special knives at Halloween that are safer than a kitchen knife) to cut out the face, 1 large can or container that can go in the top of the pumpkin, very hot water, and 3 to 5 pounds of dry ice. First find a large can or container that you want to use inside of the pumpkin. Then find a pumpkin that you can cut the top off and place the can in the cavity of the pumpkin. Carve a face on the pumpkin. When I carve it I like to put a notch on the lid of the pumpkin so that I can always put the lid on so that it seals. When you are ready to display the steam effects, place chunks of dry ice in the container. (Always use heavy gloves when you are moving dry ice because it will burn anyone who touches it, and never put it in a closed container.) I like to heat the water in a teapot and then pour it over the dry ice and the dry ice steam will pour out the face of the pumpkin creating a wonderful spooky effect. The steam will last up to 5 minutes, depending of how hot the water is. This special offer includes Dian Thomas' Holiday Fun Year-Round book plus her NEW 2-DVD set, Creative Holiday Ideas with Dian Thomas. You’ll love the holiday ideas in the full color book (nearly 200 pages). See the best of Dian’s ideas on the DVDs from her 30+ years on national television! Her warm, energetic personality comes to life on your screen. Regularly $59.98, this package is being offered for the holidays at only $24.99 — just in time for the holidays. Don’t miss this opportunity to create some lasting memories that you’ll cherish forever. Book and 2 DVD Set Now Only $24.99. Go to www.DianThomas.com to order or send a note to dian at info@DianThomas.com.